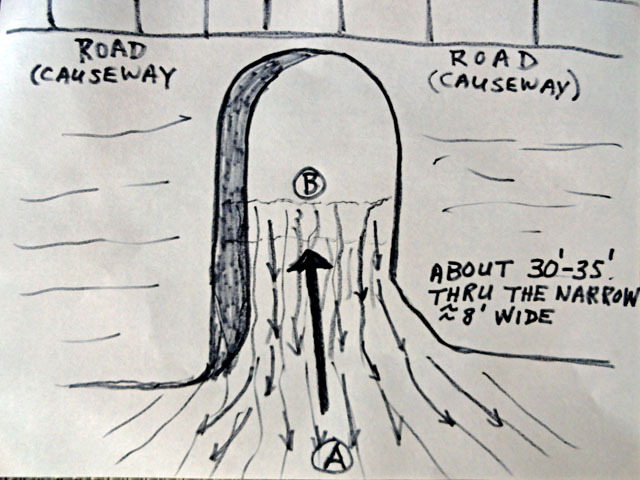 Problem: I found myself on the wrong side of the culvert at the wrong time – see attached sketches. I was on side A and needed to get to side B. Tide was going out and the rapids through the culvert was too strong for canoe, kayak or trolling motors (maybe even small gas motors). Made two attempts to get through–my approach from the sides was wrong (positions C and D)…wasted too much energy, current pushed me back, and couldn’t continue. Waited approximately 30 minutes to regain strength and a tide change, which didn’t happen–if anything the current got worse. 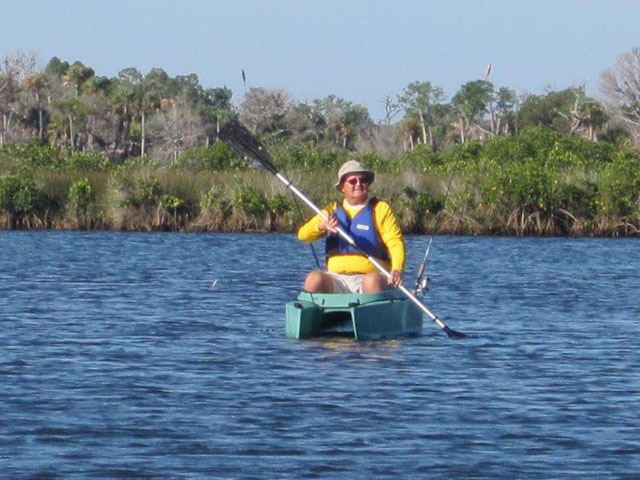 I had to be quick to make adjustments when I started to drift off center… I knew from previous experience that paddling strong on one side wouldn’t do it, so I’d do a quick back paddle on the appropriate side…that was my method of progressing: forward strokes (5,8,10, or…) and then a quick backstroke. With local fishermen and women cheering me on, I made it through, and made it home on time for an important appointment. I made it through this culvert before against the tide with my sit-in kayak but never with a current this strong. This time I would not have made it in my sit-in… The reason: the current irregularities would twist me off center and it would be impossible to correct, and I’d be pushed into the sidewall and back to where I started. The Wavewalk’s tracking benefit was really apparent. Standing next to my W kayak. 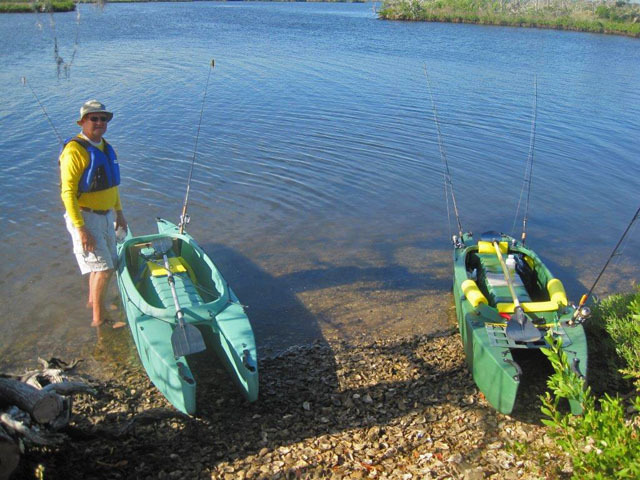 Gary Rankel’s W kayak is on the right. Great combination of suspense and instructive technical information! Tidal currents can be extremely difficult to deal with even for experienced paddlers such as yourself. There’s a trick that works when dealing with strong wind that works for strong currents as well: Depending on where you want to go, changing your location along the W saddle can get the adverse external force to do some work for you (see here: http://wavewalk.com/blog/2009/07/16/w-kayaking-in-strong-wind/ ). Dealing with winds and currents that are much more powerful than you and your kayak is always challenging, especially when your own paddling makes your kayak zigzag. This is much less of a problem when you’re w kayaking. Having the paddler fixed to the middle of his kayak makes no sense since there’s so much to gain from small forward and backward relocations. Still, all kayaks except the WaveWalk force their users to stay in that same location and suffer from poor tracking in strong wind and fast currents, and that also means having to use rudders, which is really dumb and annoying, and nobody really likes it. I just can’t believe that I paddled such traditional kayaks for years and that so many people still use them! Sometimes I think of such kayaks as collections of design errors. Traditional mono-hull kayaks are the user-unfriendly result of an aggregation and combination of many constraints and demands, and not necessarily of errors since there’s no way to come up with something better within the mono-hull form. When you take an aboriginal arctic hunting paddle craft created by and for super fit small-size people, and you try to turn it into a leisure craft for Westerners, you’re bound to get some absurd results. That culvert can be really tricky with strong tidal currents, so I always try to schedule our trips to navigate it with the tidal current (leaving on the outgoing and returning on the incoming). 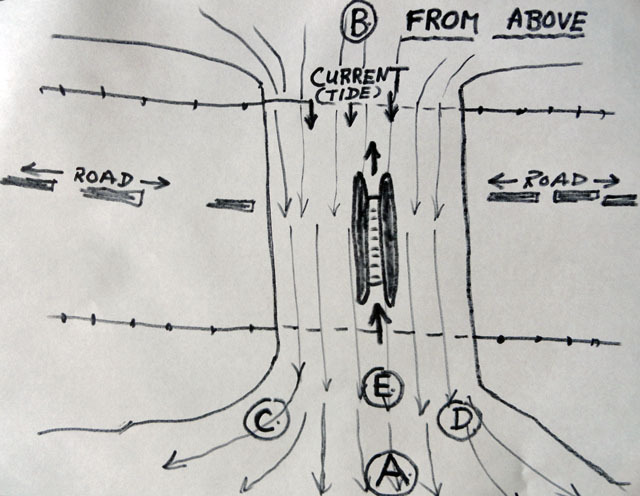 Occasionally, as exiting the culvert with the current, however, you also have to dodge one or more fishing lines from anglers fishing from the road above, creating an additional challenge of having to initiate quick turns in the swirling current to avoid the lines. The Wavewalk seems to facilitate making those quick turns. It’s nice to be in a kayak that goes where you tell it to go! Especially when it isn’t slowed down by skegs and and rudders.